The Revell "75th anniversary" kit includes a standard Tiger turret bin. This is the correct bin for Tiger "231", one of the kit's decal options. But it is the wrong bin for the headline tank, "Tiki". The real "Tiki" had a wider turret bin than what the kit provides. It was so wide that notches were cut on both sides of it, to prevent it colliding with the hatch and the pistol port. 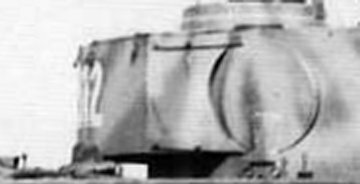 Tiki's turret bin also had two bolted support arms on each side. This is a photo of "Tiki" itself.